All transactions are safe and secure with a reliable history in online purchasing behind each of our associates. Buy the Camp Rock Costumes to own Camp Rock clothing and merchandise. There's no better way to embody the spirit of the original Disney Channel movie than with these Mitchie Camp Rock costumes. 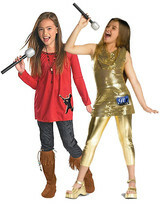 Choose from among several outfits, including Mitchie Torres' Final Jam costume and a gold sequin It Girl ensemble. Add a microphone and other props to make your pop star outfit complete. Dress a cute guy friend in a Shane costume so that the two of you can karaoke "This is Me" together from the movie's soundtrack. It will be hard to hide who you wanna be in these costumes. In addition to the Camp Rock Costumes above, browse the Camp Rock Clothing Gallery for more apparel like men's and women's clothes, kids shirts or hoodies.